Dubai, United Arab Emirates: TTM, a KBW Investments portfolio company, has been awarded the exclusive contract to design and implement post tensioning technology for C09 Lusail Marina. Located in Lusail City, Qatar, the project’s contractor and developer, Al Wefaq Engineering Co. (Al Wefaq), appointed TTM in June 2016. The TTM contract, valued at QR1,000,000 is one part of the overall QR110,000,000 investment made by Al Wefaq into the new development. Commencement of project redesign by six TTM professionals began in July, with an expected six-month duration targeting a December 2016 completion date. “The C09 Lusail Marina project was initially designed with the conventional method of reinforced concrete (RC) slabs. TTM proposed that introducing post tensioning would result in developer cost-savings, together with a much more efficient timeline of execution,” explained Sameel Hamza, Chief Operations Officer, TTM. “TTM was awarded the jobsite based on the significant financial and technical benefits of implementing the post tensioning method into the structure’s design. A post tension system poses benefits for all parties involved both in the immediate-term, such as the reduction of labor required onsite, and in the long-term, as slabs are designed crack-free thereby helping to enable waterproofing.” With an average cost reduction of 25 percent per jobsite, post tensioning is replacing RC slabs in buildings across many of the new developments in the Gulf state. 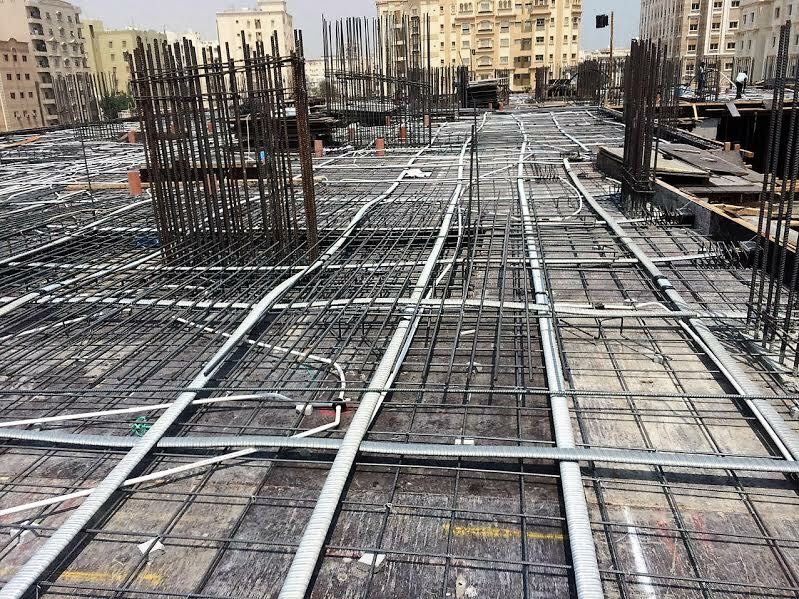 Seeking to implement higher building standards and simultaneously looking to reduce construction timelines by using early formwork stripping and reduced backpropping – ultimately leading to a quicker construction cycle – Qatar’s developers are increasingly adopting post tensioning technology over traditional methods. As opposed to steel-laden RC slab beam installation, which takes up unnecessary building space and takes 50 percent longer to build, post tensioning utilizes flexible steel wiring that allows for an increase in floor space and reduces floor height. “All TTM Strands are produced at the TTM factory in Milan, Italy. The only post tensioning company in the world that produces steel wire in house, TTM’s value proposition of our technology begins at the material stage. Contractors and developers using TTM are able to confidently implement our technology armed with the knowledge that a full track record of material sourcing exists, and it is all created to work optimally together for the best possible end product,” continued Hamza. According to Al Wefaq, the C09 Lusail Marina jobsite is planned to have a total built up area of 25,900 sq. m., and is scheduled for completion date in Q2 2017. An interactive map of the proposed smart city 38-kilometer development by Lusail Real Estate Development Company (LREDC) can be accessed here, and includes renderings of the four islands and the 19 multipurpose residential, mixed use, entertainment, and commercial districts. Chaired by HRH Prince Khaled bin Alwaleed bin Talal, TTM is a KBW Investments portfolio company. KBW Investments works across a number of sectors including construction, finance, consultancy, and development. With a diversified portfolio presence in three continents, the Group’s focus is synergistic acquisitions and company formations to continue to build on existing strengths and further develop KBW Investments brands. The Group, actively investing in both large scale companies and early stage startups, is headquartered in Dubai, United Arab Emirates.